WSU is providing me the opportunity to reflect on who I am and what I want to do, and importantly, how to communicate those ideas. As I previously noted, a resume (here) spanning 30 years of work is poorly suited to either communicate the themes of that work or to span the transition in that work from print journals to blogs and wikis. 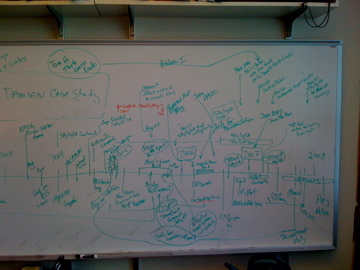 For example, here is a whiteboard where I tried to capture a timeline of the ideas and problems I was working on across my work life and personal life from 2000 to 2008. The last two years, working on the Harvesting Gradebook, has had me thinking about the impact of the Internet on learning and higher education as presently constituted. My focus swings between learners getting feedback to aid the learning and learning being credentialed (assessment for and of learning). I am not formally credentialed for almost all the work I’ve done in the last 30 years — my credentials from that work and are community based. 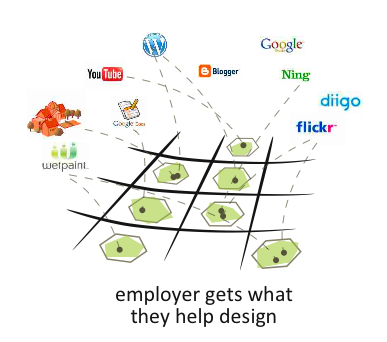 But what if the learner is trying to join a community that hasn’t designed credentialing criteria? What if the learner is trying to forge a community around a problem? That is my situation. I have a variety of experiences, but they are not specific to the new “sustainable Moscow” work that is my passion. I need a way to create a CV that converts my experiences into credentials that a new community values. This entry was posted on December 7, 2010 at 8:18 am and is filed under Learning Portfolio, Reflection-in-action, Seeking Help. You can follow any responses to this entry through the RSS 2.0 feed. You can leave a response, or trackback from your own site.